The five-time European champions thrashed Manchester City 5-1 on aggregate in the Champions League. Jurgen Klopp says Liverpool have become more consistent in recent times. LIVERPOOL MANAGER JURGEN Klopp hopes his side’s Jekyll and Hyde nature is a thing of the past as they aim to avoid a European hangover at home to Bournemouth on Saturday. 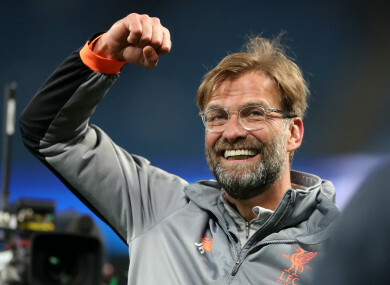 Victory will take Klopp’s men another step closer to sealing a return to the Champions League next season just days after they booked their place in the semi-finals of the competition for the first time in a decade. “We mature constantly. The boys get more and more used to situations like that,” said Klopp after beating City for a third time in four meetings this season. Vital to Liverpool’s greater consistency has been the presence of centre-back Virgil van Dijk. The Dutch captain cost a world record £75m for a defender in January, but has lived up to his price tag in marshalling a defence that has conceded just seven goals in their past 13 matches in all competitions. Van Dijk has brought a leadership previously lacking in Liverpool’s back line and has helped accentuate huge improvements in those around him such as goalkeeper Loris Karius, centre-back partner Dejan Lovren and inexperienced full-backs Andy Robertson and Trent Alexander-Arnold. Liverpool rode out what Klopp called a “whirlwind” first 45 minutes from an all-out attacking approach from Pep Guardiola in midweek, conceding only once when Van Dijk claimed he had been fouled before Raheem Sterling set up Gabriel Jesus. Of City’s 20 shots on Tuesday night, 12 were blocked as Liverpool protected Karius’s goal and showed another side to the fast-flowing attacking football led by Mohamed Salah, Roberto Firmino and Sadio Mane that has characterised their season. Salah and Firmino were on target to turn the second leg around in the second-half and take the prolific front three’s tally for the season to a combined 79 goals. Email “Jurgen Klopp says Liverpool's Jekyll and Hyde nature is a thing of the past”. Feedback on “Jurgen Klopp says Liverpool's Jekyll and Hyde nature is a thing of the past”.